A seismic swarm started on 17 February, with activity peaking by 20 February, and still declining as of 26 February (figure 1). More than 300 small high-frequency earthquakes (eight with M > 3.0) were recorded, the largest (M 4.0) at 0319 on 19 February. 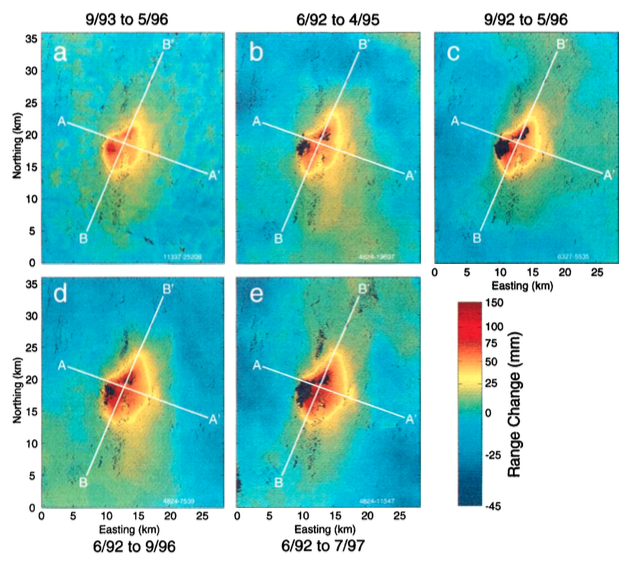 Hypocenters show a 3-km-long pattern elongated to the NNW, at 3-5 km depths (figure 2). The focal mechanism for the largest event showed mainly strike-slip motion (right-lateral on a N-S plane, or left-lateral on an E-W plane), with a small normal component. There were no reports of injuries or damages. Figure 1. Hourly number of earthquakes in the Coso Mountains, 17-26 February 1992. Courtesy of the USGS. Figure 2. Epicenter map (top) and E-W cross-section showing focal depths (bottom) of >300 high-frequency earthquakes recorded in the Coso Mountains, 17-26 February 1992. Courtesy of the USGS. The Coso region is an active geothermal area that has had seismic swarms in the past, as in 1982 when thousands of events were recorded, the largest M 4.9. The Volcano Peak cinder cone and lava flow, apparently the youngest features in the Coso Mountains, are believed to have been erupted 0.039 ± 0.033 mybp. (K/Ar age). Information Contacts: J. Mori and W. Duffield, USGS. The Global Volcanism Program has no Weekly Reports available for Coso Volcanic Field. 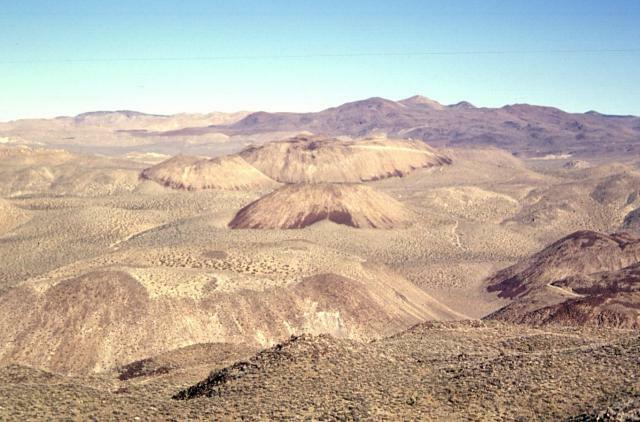 The Coso volcanic field, located east of the Sierra Nevada Range at the western edge of the Basin and Range province consists of Pliocene to Quaternary rhyolitic lava domes and basaltic cinder cones covering a 400 km2 area. Much of the field lies within the China Lake Naval Weapons Center. Active fumaroles and thermal springs are present in an area that is a producing geothermal field. The youngest eruptions were chemically bimodal, forming basaltic lava flows along with 38 rhyolitic lava flows and domes, most with youthful, constructional forms. The latest dated eruption formed the Volcano Peak basaltic cinder cone and lava flow and was Potassium-Argon dated at 39,000 +/- 33,000 years ago. Although most activity ended during the late Pleistocene, the youngest lava dome may be of Holocene age based on geomorphological evidence (Monastero 1998, pers. comm.). Duffield W A, Bacon C R, 1981. Geologic map of the Coso volcanic field and adjacent areas, Inyo County, California. U S Geol Surv Misc Invest Ser Map, I-1200, 1:50,000. Duffield W A, Bacon C R, Dalrymple G B, 1980. Late Cenozoic volcanism, geochronology, and structure of the Coso Range, Inyo County, California. J. Geophys. Res, 85: 2381-2404. Monastero F C, 2002. Model for sucess: an overview of industry-military cooperation in the development of power operations at the Coso geothermal field in southern California. Bull Geotherm Resour Council, 31: 188-195. Monastero F C, 1998. (pers. comm.). The Global Volcanism Program is not aware of any Holocene eruptions from Coso Volcanic Field. If this volcano has had large eruptions (VEI >= 4) prior to 10,000 years ago, information might be found on the Coso Volcanic Field page in the LaMEVE (Large Magnitude Explosive Volcanic Eruptions) database, a part of the Volcano Global Risk Identification and Analysis Project (VOGRIPA). Remarks: Subsidence of the Coso geothermal area has a short-wavelength component that is likely anthropogenic in nature, and a long-wavelength component that is probably magmatic. Five unwrapped interferograms in order of increasing amount of time spanned (Table1). The colorbar shows the correspondence between range change and color. Black areas correspond to regions of low coherence. (a) An 32-month interferogram fromSeptember 15, 1993, to May 10, 1996, (b) an 34-month interferogram from June 17, 1992, to April 21, 1995, (c) an 44-month interferogram from September 30, 1992, to May 11, 1996, (d) an 51-month interferogram from June 17, 1992, to September 28, 1996, and (e) an 61-month interferogram from June 17, 1992, to July 5, 1997. From: Wicks et al. 2001. Reference List: Fialko and Simons 2000; Wicks et al. 2001. Fialko, Y., & Simons, M., 2000. Deformation and seismicity in the Coso geothermal area, Inyo County, California: Observations and modeling using satellite radar interferometry. J. Geophys. Res., 105(B9), 21781-21793. Wicks, C. W., Jr., W. Thatcher, F. C. Monastero, and M. A. Hasting,, 2001. Steady state deformation of the Coso Range, east central California, inferred from satellite radar interferometry. J. Geophys. Res., 106, p. 13,769-13,780. There is no Emissions History data available for Coso Volcanic Field. The Global Volcanism Program has no photographs available for Coso Volcanic Field. IRIS seismic stations/networks Incorporated Research Institutions for Seismology (IRIS) Data Services map showing the location of seismic stations from all available networks (permanent or temporary) within a radius of 0.18° (about 20 km at mid-latitudes) from the given location of Coso Volcanic Field. Users can customize a variety of filters and options in the left panel. Note that if there are no stations are known the map will default to show the entire world with a "No data matched request" error notice. Large Eruptions of Coso Volcanic Field Information about large Quaternary eruptions (VEI >= 4) is cataloged in the Large Magnitude Explosive Volcanic Eruptions (LaMEVE) database of the Volcano Global Risk Identification and Analysis Project (VOGRIPA).